Dude’s future is so bright his ears have to wear shades. Given his long and well-documented penchant for Auburn shirts, hats, and decorative road signs, it was only a matter of time before Dr. Dre got an Auburn man to endorse his wildly-successful line of Beats By Dre headphones. 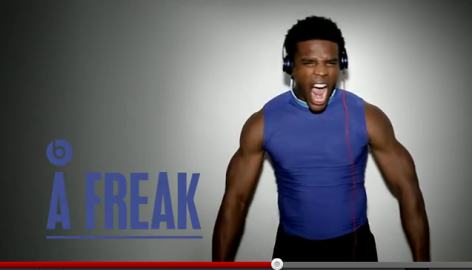 The Blessed Freak appears 17 seconds into this 30-second spot sporting a pair of Beats colored Carolina Panther-blue (or is it Auburn Tiger-navy?). Among the all-star cast of other icons and entertainers is Lil Wayne, who has been known to (NSFW) “go H.A.M., Cam Newton” himself. There’s also a photo of Cam eating a football on the Beats By Dre homepage. As for Dr. Dre and his mysterious relationship to Auburn, we’ll keep our ears open. There has to be a reference to Raiders Bo on some obscure N.W.A and the Posse-era track or something. Related: Can you find the Aubie in Cam Newton’s forehead?